Summary: Most of the bread products consumed today are made of refined grains. Are our breakfast cereals and "fortified" loaves as healthy as we like to think? There is a jingle that goes: "The whiter the bread, the sooner you're dead!" Bread has been called the "staff of life." But because most folks consume grain in its refined state, this staple contains virtually no nutritive properties and cannot support animal or human life. "Fortified" grain products are also useless and deceptive. Wheat is the key ingredient in the American diet. But after being milled, it is seldom utilized in its whole form with its components intact. Invariably, when we eat wheat, we get it in the form of bread, pies, cakes, cookies, biscuits, spaghetti, cream of wheat, cereals, and other forms that have been treated, heated, fractioned, and fragmented until it is next to impossible to recognize it for what it was originally. A refined grain, or its product, is made by processing a natural, whole grain so that some or most of the nutrients are lost. Almost all grain products have been refined in some way or another. White rice, cream of wheat, cookies, and bowls of snap-crackle-and-pop each morning are all examples of refined grain products. Why are Refined Grains Harmful? 1. They are excessively starchy. 2. They are practically devoid of natural fiber. 3. There can be up to approximately 25 different chemicals that are added to refined grains and breads products. 5. They are "enriched" with synthetic vitamins. 5. Bleaching chemicals are used. 6. Artificial colorings and flavorings are used. 7. They are nutritionally imbalanced. Because refined grain products are nutritionally imbalanced, they are responsible for contributing to several degenerative diseases. Calcium leaching from the bones and teeth occurs because of the altered phosphorous-calcium balance in these products. Sugar and refined grain products are primarily responsible for tooth decay in this country, as well as being the major cause of brittle bones in the elderly. The making of bread and flour products took a real turn for the worse at the end of World War 2. Bakeries in America began using large amounts of chemicals, additives, bleaches, and preservatives. The millers discovered they could make the flour very white by bleaching it. Other chemical oxidizers are added to bleach and "mature" the flour, such as nitrogen dioxide and azocarbonamide. Are these chemicals dangerous? Well, Germany banned all such oxidizers back in 1958, almost 40 years ago! The next step in the chemicalization of bread is to add chemical dough conditioners to the dough to enable the resulting bread to stay fresh and soft for a longer period, without getting stale while standing on grocers' shelves. To give this softness and white-bread texture, mono- and diglycerides are added to the bread dough at the rate of about 1/4 pound per year per person consumption. This makes the bread more plastic or squeezable. Nobody knows the effects on those that eat such additives. Some of the chemicals used as dough conditioners are similar to the anti-freeze mix used for automobile radiators. One of the chemicals used as a dough conditioner is polyexy ethelyne monosterate. Workers in factories where this chemical is made have been known to develop skin rashes from the fumes. Polyexy ethelyne monosterate is also used in making peanut butter, ice cream, candy, and salad dressings. 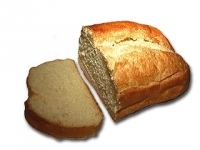 The average person eats about 100 pounds or so of commercial bread each year. Besides eating the refined flour, the average person also eats these toxic items in the grain products: 2 pounds of salt, 3 pounds of sugar, 2 pounds of skim milk powder, 2 pounds of yeast, 1 pound of enzyme-activator, 1/2 pound of sulfate, chloride, and bromate chemicals, and 1/4 pound of other food additives. When all of these chemicals and nonfoods are eaten together, a multi-toxic effect occurs that has never been thoroughly studied by scientists. Surely, the cumulative effect of daily intake of such chemicals present in bread must be disease-inducing over time. Over 20 vitamin and mineral elements are removed when whole wheat is converted into white flour, yet only four or five are replaced by enrichment. And these are supplied in an inferior synthetic form, which the body cannot use, and that does more harm than good. Synthetic vitamins are coal tar products, and coal tar products are suspected of being cancer-producing. Synthetic vitamins are products of the chemical laboratory or factory. They cannot replace the natural vitamins that are formed in grains that grow on the open field in the sunshine. Although most grains consumed in America are in the form of breads, cereals, or pasta, other products are used in large amounts. White rice is generally polished, whole rice. This polishing strips away many of the B vitamins and some of the protein. This is about the same thing that happens to refined wheat. White rice is a nutritionally unbalanced food and should never be eaten. For improved health, eliminate all refined flour products from your diet. Only use whole grains. The crux of the situation is that the shelf-life of products are far more important in our economy than the health and well-being of the people. If we are to lean on the "staff of life" for nutrition, we must identify the counterfeit refined grains from the real, whole grains. In the US, the familiar white flour which is the result of modern refining process is 72% extraction. This means that it has lost 28% of the bulk of the wheat, including half or more of many of the crucial nutrients. J.I. Rodale, The Health Finder (London: Rodale Press). Jacqueline Verrett, Ph.D., Eating May Be Hazardous to Your Health (New York: Simon and Schuster). Rudolph Ballentine, M.D., Diet & Nutrition.